TG208: Four Iron Maiden covers to collect! 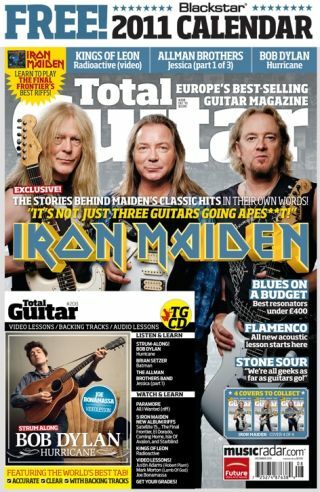 Issue 208 of Total Guitar is available nationwide now and it's another busy issue, available with four collectable Iron Maiden covers (Dave Murray, Janick Gers, Adrian Smith and all three). Find out the real stories behind their biggest hits in detailed interviews with Dave Murray, Janick Gers and Adrian Smith. On ditching the 'pop punk' tag and setting their sights firmly on rock. 50 years on, Hank revisits 'The Shadows', the album that made him the guitar legend he is today. Be sure to check out our online track-by-track guide with the man himself. Jim Root and Josh Rand explain the dynamics of their partnership on new album 'Audio Secrecy'. Paul Gilbert explains how his mind-bending new album, 'Fuzz Universe', goes beyond shred to put melody first. Indulge your fiery side with complex structures, fast scale runs and exotic-sounding chords. The alt-country group talk the vintage gear, magic amps and the crazy tunings behind their sound. Win a DBZ Barchetta Absinthe guitar worth £799! Enter our competition to win a DBZ Barchetta Absinthe guitar and pay homage to the drink that allegedly lost Van Gogh an ear! What part of that title do you not understand? Hank sits down with TG to talks us through The Shadows pioneering self-titled debut album. Hear Peavey's new iPhone modelling app put through its paces by TG's reviews editor Stuart Williams.